Just a few decades ago many people with disabilities or mental health needs were locked away from the rest of Britain in institutions, their voices ignored and their stories unheard. At United Response, which is now celebrating 40 years of challenging injustice, we want to rectify that. Postcards from the Edges gives anyone whose life has been impacted by disability or mental health the chance to speak to the world in a postcard – using words, photographs, art or anything that captures the imagination. The website (www.postcardsfromtheedges.org.uk) and hub of the project was launched at the beginning of February and features over 400 postcards. Each week it features a postcard of the week. 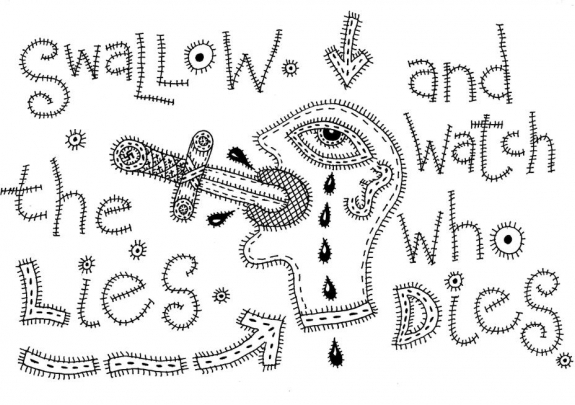 The latest postcard of the week was created by Ian Pyper and is called ‘Swallow Hard’. “I’m an artist with only two fingers and a thumb on each hand – not something I consider so much as a disability, but more a physical difference,” explains Ian. You can read the full story of “Swallow Hard” and find many more postcards on the Postcards from the Edges website. Ian has two more postcards on the website: ‘Born brave every day’ and ‘Some people become easy targets’. You can also find more of his artwork on Outside In. Ian’s work is described as ‘Future Primitive’, and has been shown and sold in galleries across the world. Be the first to comment on "Postcards from the Edges: ‘Swallow Hard’"